- surmised that the vase in the first photo was an Oceanic variant, and as I now know, it is a variant with its own name: Esmeralda. 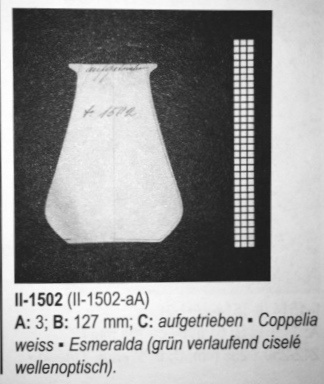 This was further confirmed by an image provided by Kai Hasselbach of a piece in the same decor on PN II-963, which lists Esmeralda among the decors for that shape. Thanks to Alfredo's original post, Kai's vast collection of images, and my own obsession with memorable pieces, I am pleased to be able to confirm this new Loetz decor - Esmeralda- grün verlaufend (green spreading) ciselé ("chiseled" oil-spot) wellenoptisch (wave optic). congratulations - a fine piece of sherlocking! Well Done! Thanks for the info Warren. I've been looking for it, Al - you would think it would be in there somewhere! Great work, Warren! We will be posting this new decor on the site for sure. 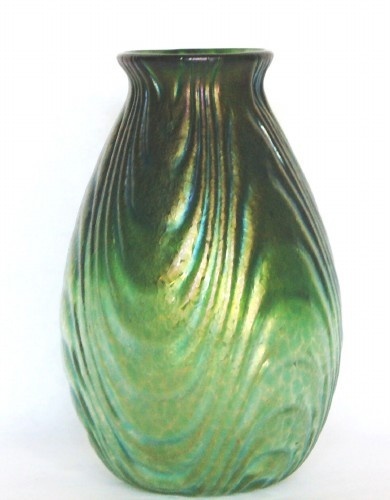 Now the world will be able to learn about your discovery of a new Loetz decor, "Esmeralda"! 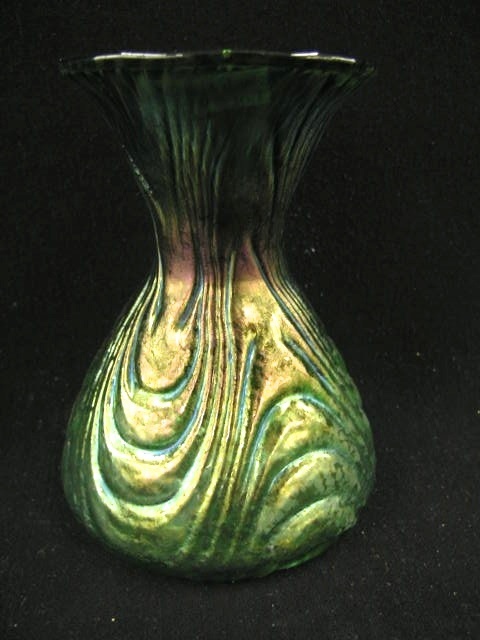 This is also an opportunity to encourage others on CW for their help in looking up PN's, discovering new decors and submitting photos of pieces like these so that we can show various examples of rare decors. Fine detective work Warren. Congratulations. How exciting! What a wonderful piece of research. Don't you love it when those with the puzzle pieces share and viola new discoveries are made. Thank you Warren, Alfredo and Kai. What magic. I love this site and all it brings to my life. Thank you all for allowing me to be part of something so special.